This unique recipe combines taste, fresh ingredients, rich colors, and delightful flavors. 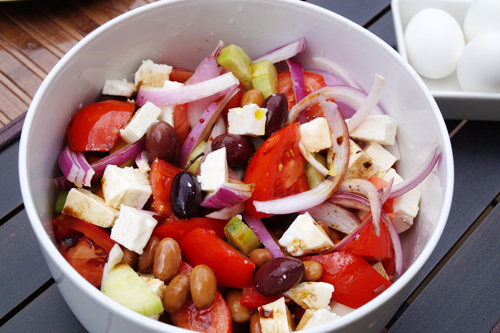 It is light, diet-friendly, Mediterranean, and very refreshing. Our salad is quick to make and looks great. It is a must-make salad if you have friends coming over for dinner. We really like the feta, beans, and tomato combo, and this is one of our family's year-round favorites. I've served it countless of times. It is ideal for all seasons, and the ingredients are packed with nutrients. You can add your favorite veggies for more color and richness of taste. Put the beans in a colander and rinse it with water. Drain well. Combine the olives, red onion, beans, tomatoes, and cucumber. Toss to mix well. Garnish with feta. Optionally, you can add 1 - 2 cloves minced garlic, fresh cilantro leaves, and 1 can of artichoke hearts. Combine the dried oregano, thyme, basil, parsley, and minced garlic. Add water and season with salt and pepper. Then pour in a bottle or jar, and shake to mix well. Pour the dressing over the salad. Alternatively, you can make olive oil dressing. Combine the lemon juice with olive oil and season with salt and pepper. Refrigerate for 1 - 2 hours and serve.